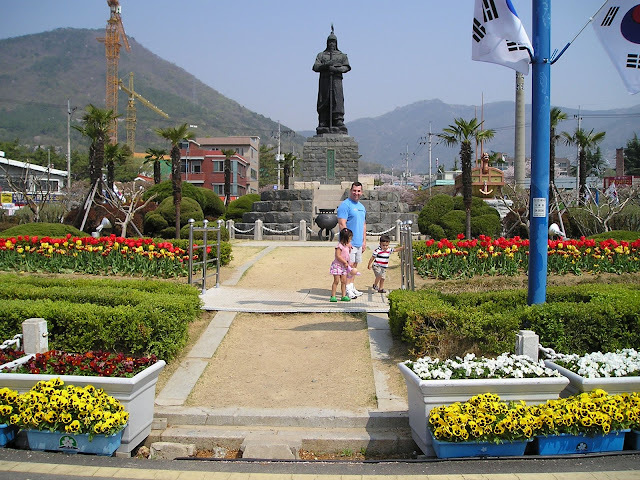 This picture was taken at one of the General Yi Circles here in Chinhae. We love to come here during our family walk because the smell of the beautiful flowers is awesome. Sometimes the water fountains are also on, so our kids are into that. What I love in this area is the turtle ship on the side of the General's statue. This was originally post on April 25, 209 when we were still in South Korea. What a beautiful flowers.. I love the places with full of flowers.. It is very pleasing to the eyes..
nice view here, joops. korea is such a pretty place, no wonder why you guys are always out! a very nice place to chill out! hopped here bud! take care! nice bonding time with your family. my sister worked in pusan, south korea. she said it's a beautiful country like ours. They're really pleasing to the eyes--I love flowers!! nice pics! I have a tag for you...please visit my blog!